As Multi-Tasking Staff Group C Posts exam for the candidates who are possessing Matriculation (10TH) Qualification in any stream from recognized board. Additional qualification for the same mentioned below. SSC had made changes in the minimum and maximum age limit from the past years. SSC has notified that the upper age limit will be 25 years and minimum age limit is 18 years. As I told you above candidate must go through two phases that is Paper-1 Written examination (Objective types of questions) and Paper-2 Skill Test (Qualifying in nature). Now I am discussing it briefly. There will be 4 Section (Paper A, Paper B, Paper C, Paper D). Short Essay/Letter in English or any other language included in the 8th schedule of the Constitution. Application are invited in the prescribed format from eligible persons, who are Indian nationals, for recruitment given Posts for Various region wise 10,000 vacancies by various employers indicated in the advertisement i.e within 30 days. Eligible candidates can do online registration & Download official notification from the link below and then, applicant can fill downloaded application form for future Use. According to the latest SSC MTS notification there are SSC CGL calendar which contains date for your different exam Tiers. You must check it carefully. All the information given above is as per the staff selection commission MTS latest notification. 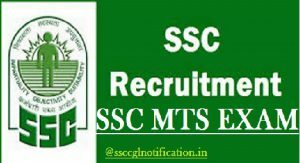 We advise you to book mark this page as we will provide you further information as soon as latest notification for SSC MTS 2019 Exam will arrive.